Biology of bumble bees – Bumble bees are a group of bees with more than 250 species worldwide, and are one of the three groups of bees which show a well-developed social behavior. They are present in most bio geographical regions of the world, except the Ethiopian, Australian, and Oceanic regions. The group is especially diverse in the Palearctic and Oriental regions, and is well represented in the new world, especially in the Western Nearctic and Western Neotropical regions. The group was recently organized in 15 subgenera, three of them with species in the neotropics (http://www.nhm.ac.uk/research-curation/research/projects/bombus/regions.html). The genus Bombus can be separated into long-tongued or short- tongued bumble bees. The long-tongued bumble bees are “pocket makers” while the short-tong ones are “pollen storers”. Pocket-makers place the pollen in receptacles formed near bunches of larvae, while pollen storers put pollen in cells detached from bunches of larvae. This behavioral difference has important implications in terms of rearing. In contrast to the other social bees, Bombus oviposits more than one egg per cell, usually eight eggs, and the cell is subdivided as the larvae growth and mature. Bombus, like Apis, fed the larvae progressively throughout their development. A bumble bee colony is initiated by a solitary queen that produces new worker bees that upon maturity increase the flow of resources to the colony sufficient for the production of the next generation of drones and gynes (future queens) that is the goal of the colony activities. Bumble bees are important pollinators of crops and some species have been commercially reared and introduced to many countries. The most common commercially reared species is the short-tongued, pollen storer, paleartic Bombus terrestris ,which had been introduced to many countries for green house tomato pollination. In 2004, an estimated million colonies were distributed around the world, mainly for tomato pollination. The value of those pollinated crops for that year was €12000 million. Other important reared species are B. occidentalis and B. impatiens which have been used in USA, Canada and México, and B. lucorum and B. ignitus in China and Japan. All of the commercially reared species except B. ruderatus are short-tongued bumblebees. B. ruderatus is a long-tonged,”pocket maker” species that was introduced from England to New Zealand, and from there to Chile, and is important for red clover production. Long-tongued bumble bee species such as B. ruderatus are used to pollinate crops with long corollas , but the demand for colonies greatly outnumbers the actual production. 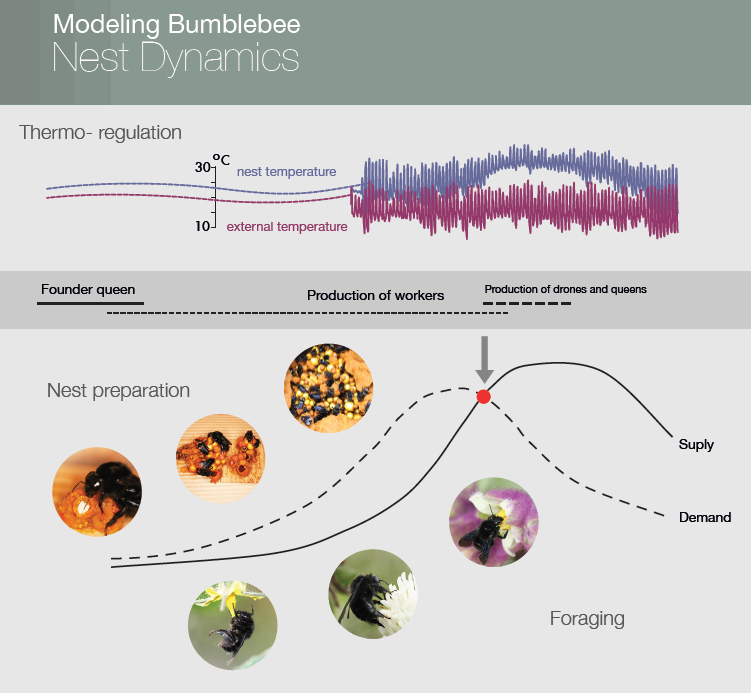 Modeling the dynamics of Bombus atatus — B. atatus is a long-tongued bee, which is widely distributed in South America, and has been successfully reared, and shows good potential for pollination of tomato pollination, Solanum quitoense and traditional horticultural crops such as strawberries and blackberries. It is also common in red clover in the Colombian highland savannas. An important characteristic of B. atatus is that it adapt well to disturbed landscapes. Historically, four B. atatus species occurred in the urban environment of Bogotá city and its surrounding grasslands. Today, after the native vegetation was highly replaced by pastures for cattle growing, only B.atratus has survived, in spite of the active suppression of their nests by the farmers. The other three species described in the 1938 paper: B. hortulanus, B. robustus, and B. rubicundus, are found in the mountains around the city, and no longer in the grasslands. In Colombia, Bombus atratus can be found from 150 to 3500 m of altitude (Ospina et al. 1987). In other countries the distribution is also broad; in Bolivia it is found from Beni in the Amazon to La Paz; in Argentina in the northern part of the country and the Andes and in Brazil from Rondonia in the Amazon basin to the southern states. Besides the solitary and eusocial phases characteristic of all Bombus species, B atratus colonies can be perennial in the tropical and subtropical range of its distribution, including the high Andes, showing alternation between monogynic, poligynic , orphan and inactive cycles (Zucchi, R., 1973; Silva-Matos y Garófalo. 1995; González et al. 2004). According to Cameron and Jost (1998), in the southern range of its distribution, the queens can get into diapause. The wide distribution of this species can be helpful for studying basic ecology principles as, for example, the influence of abiotic factors on behavior (see Milliron, 1973). In wild conditions, the immature developmental time can vary between 26 and 30 days, depending on both, altitude and latitude (González et al. 2004). After mating, the founder queen initiates a nest, but to do this she must forage for nectar and pollen she uses for respiration, maturing eggs and to building cells, for progeny production, and to feed the first batches of larvae of diploid worker bees When adult workers emerge in the colony, they take over the activities of cell building, feeding of larvae and the queen, thermoregulation and cleaning the colony. Once the colony is well established queen are thought to switch to the production of sexual forms (gynes and drones). Gynes like workers are diploid but the larvae rearing period is longer allowing gynes to grow bigger than workers are. Drones are haploid and are similar in weigh to workers. Gynes and drones leave the colony to mate, and some of mated gynes (i.e. new queens) successfully start colonies to complete the cycle. For the ongoing modelling work, our focus has been Bombus atratus. The data comes from a large number of data sets (≈ 40), and from laboratory to field rearing.